Want to live to the age of 100? Take lessons from the people of Okinawa, Japan’s southernmost prefecture. We live in a world that worships youth and we spend billions every year trying to look and feel younger. But when was the last time you heard of somebody who wanted to turn forward the hands of time? In the country boasting the world’s longest life expectancy, Okinawa, the group of islands at Japan’s southern tip, takes this game to the next level: There are roughly 70 centenarians for every 100,000 people in Okinawa, about triple the rate in such countries as the US (and more than five times that in Finland). And there’s no shame in that. Okinawans wear their age gracefully instead of trying to Botox it away. What’s their secret to a long, happy life? Somebody had to get to the bottom of this, so I flew to Okinawa’s capital, Naha, and began my investigation. At Yachimun no Sato, a pottery village north of Naha, two women (top) break up clay to get it ready for master potter Kyōshi Matsuda. What we know today as Japan’s Okinawa Prefecture was once the independent Ryukyu Kingdom, and Shuri Castle, perched on a ridge above Naha, evokes those times beautifully. After touring the castle grounds, I watched a performance of ancient Okinawan dance and took advantage of a free 30-minute beginner’s lesson on the three-stringed sanshin, the local version of Japan’s more famous shamisen. That brief encounter with the islands’ time-honoured music and dance led me to a multi-day exploration of traditional art forms and the people who are keeping them alive. It began in the tiny, cluttered workshop called Nakamine Shamisenten, where I watched Miki Nakamine as he carefully shaved the wooden neck of a sanshin he was making. He told me that he goes up to Tokyo several times a year to visit a store which sells his sanshin, but he’s always happy to get back to Okinawa, where the slow pace is much more to his liking. A few days later, Go Kadena told me something very similar. After graduating from university, Kadena had become a salaryman up in Tokyo, but eventually he began to wonder if he really wanted to spend his life riding everywhere on jam-packed trains. That’s when he made the decision to pursue the family business and learn all he could about lacquer. Kadena recalls, “I knew what my family’s business was, and I sometimes went to our store, Ryukyu Lacquerware, but I never ventured upstairs from the store. Coming back from Tokyo, I finally went upstairs and saw how the items in our store were made, with layer after layer of lacquer being meticulously applied. Suddenly I knew what I wanted to do.” He said goodbye to Tokyo’s complex, crowded rail network and moved back to Naha (which has only a single train line, a short monorail with just two cars per train), where after a one-year course, he settled comfortably into the life of lacquering. In his tiny workshop, Miki Nakamine fashions a sanshin, Okinawa’s version of Japan’s musical instrument, the shamisen. No story about old Okinawa would be complete without a mention of the diet, which differs significantly from that in mainland Japan: less rice and fish, more legumes, and green and yellow vegetables. One of the most popular of those vegetables is goya, a bitter green gourd that looks rather like a bumpy-skinned version of a zucchini. Fried with some egg, tofu, and pork, it makes goya champuru, a dish which is about as easy to come by here as burgers are in the west. Other local favourites include soki soba – a slice of pork on a bowl of wheat noodles –and taco rice, a dish which dates back only to the American occupation of Okinawa in the post-Second World War era. Goya champuru, soki soba, and taco rice, as tasty as they are, probably don’t explain the Okinawans’ long lifespans, but the Longevity Lunch just might. At Emi no Mise, a restaurant in the north of the island, owner Emiko Kinjo prepares dietary staples from her garden in traditional ways. Varying from day to day, the Longevity Lunch might include deep-fried tapioca, vinegary sweet potato leaves, shrimp tempura with fennel, lime-flavored cold noodles, turmeric, multiple varieties of seaweed, and more – but all of it in small portions, for in addition to consuming a healthy diet loaded with vegetables and low in sugar, a guiding principle in the Okinawans’ eating habits is to eat only until their stomachs are 80 per cent full. Sōki soba is a favourite local lunch. Emi no Mise lies several hours’ drive north of Naha, but it’s not the only reason to make an expedition up there, for the nearby hamlet of Kijoka is where bashofu has been lovingly brought back to life. Bashofu involves weaving fabric out of the fibres of banana plants. It’s a very labour-intensive skill, and in the island’s lean years after the Second World War, bashofu almost died out as people focused on food production and simply wore whatever mass-produced clothes were available. A lady named Toshiko Taira was bashofu’s saviour, single-handedly bringing it back from the brink of extinction and training a new generation of weavers, and in recognition of her decades of weaving and teaching, in 2000 Japan’s government conferred upon her the title “Living National Treasure.” Even today, Taira continues to make bashofu and to work tirelessly for the organisation she founded, the Kijoka Bashofu Preservation Society – at the sprightly age of 95. Despite all I’d seen, eaten, and photographed in Okinawa, I can’t say I was much closer to the secret of long life when I returned home. But I was ten days older than when I’d left, and that fact didn’t bother me in the least. In Kijōka, a village in the north of Okinawa, Mieko Taira inspects a grove of banana plants. If there’s a quintessential Okinawan art, it would have to be bingata, and the Shiroma Bingata workshop is a good place to see how it’s produced. Bingata is a technique for creating fabrics whose design is not woven into them but rather painted onto them. The results are beautiful, but they don’t come easily: sometimes three or four people are hunched over the same swath of fabric, slowly and carefully massaging the paints into the cloth with stiff brushes. 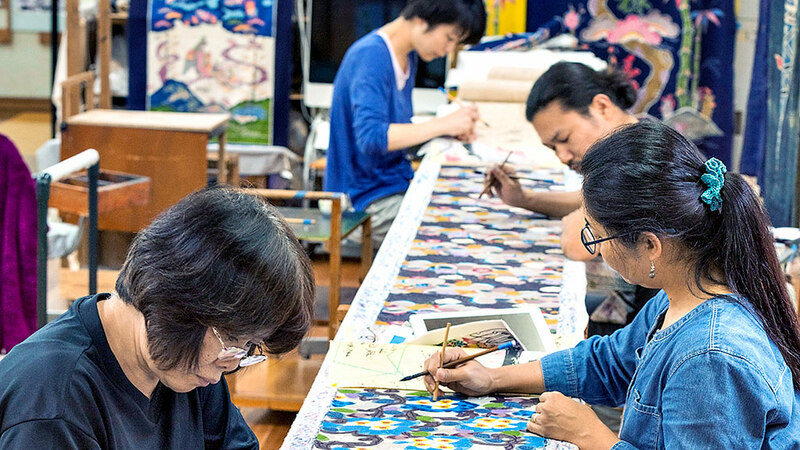 At Shiroma Bingata, sometimes four or more people can be seen laboriously working on one swath of fabric.